Change is difficult. It's not like changing clothes or getting a haircut. There is usually a standoff between two parts of me: a part that wants change and a part that wants to stay the same. This session focuses on the change process in general, a presents a challenge: do you really want to change? If so, how does this happen? For the Anger Record, it is often difficult at the start to generate a list of feelings aside from anger. In part, this is because many of us have a limited language for our emotional life. To remedy this, there are two alternative Anger Records that have lists of feelings that aid you in your search for the most exact words for your feelings. Explore both the Anger Record with Feeling List, and the Anger Record Form to see if either is helpful in naming your emotions. 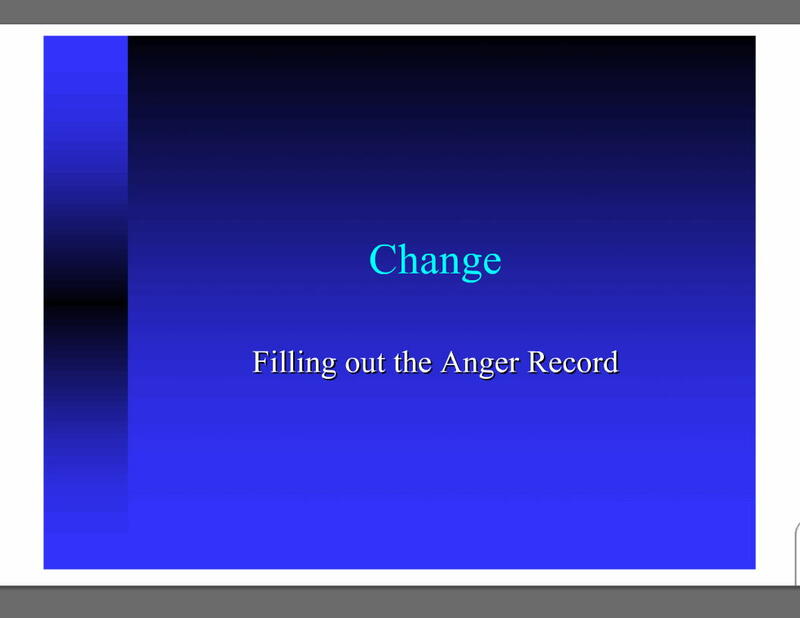 The Anger Record Form is a powerful self-scoring pdf form designed to help you notice particular problem areas. Right-click this and download it to your desktop. You will need to keep this file open until it is completed, then print it. If you close the form, the field contents will be deleted.